The party is about to begin, so hop on down to this exciting slot for some fun times and wonderful cash payouts. Click here to play! Where will you be when La Fiesta begins? 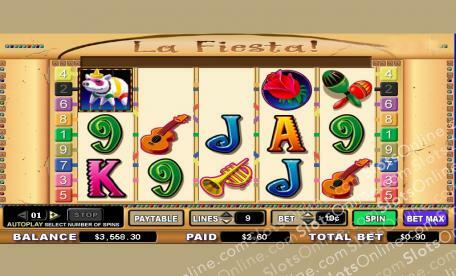 La Fiesta is a colorful 5-reel slot that is played over 9 unique pay lines; open up more lines for more winning combos! The Pinata is Wild and not only can it become any other symbol on the reels except Scatters, but it can also earn you up to 10,000 coins per spin. The Rose is Scattered and will earn payouts when its best combos appear anywhere on the reels. In addition, landing three or more Roses correctly will trigger the exciting Bonus Feature, which could win you an incredible stack of cash! It’s time to get this party started, so head on down to La Fiesta today and enjoy yourself! Roses are Scattered and can show up anywhere on the reels in order to earn a winning payout. Land three or more to trigger the exciting Bonus Round. Pinatas are Wild and can pay out up to 10,000 times your initial wager. Additionally, Pinatas can become any other symbol, except Scatters, to complete winning combinations. Land three or more Scattered Roses to activate the lucrative Bonus Round. Play your way to jackpot success in this exciting party game!